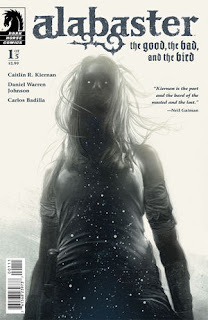 The Fellowship was fortunate enough to obtain a copy of ALABASTER: THE GOOD, THE BAD, AND THE BIRD #1 from Dark Horse Comics. Caitlin R. Kiernan writes, Daniel Warren Johnson draws, Carlos Badilla colors, and Nate Piekos of Blambot letters. Dancy was not a nice person, but she did some good. She killed some bad people in her time. She’s dead now, and her hell is one of complete solitude. She could be free if she would just say yes, but all she says is no. But now something is happening back in the world of the living that might give her a chance to return – to save a world she can never have again. There’s a jarring contrast between the two parts of the story in this issue – and the emotional effect is perfect. There’s an elegance in Dancy’s afterlife, and then there’s the crudeness and harshness of the twins. The weave of the two is beautiful, as is the starkness of the art. I especially liked the seraph and the horror it evokes. I’d like to say this is a story of redemption, but it’s way too early to tell. We’ll just have to keep reading to find out, I guess. ALABASTER: THE GOOD, THE BAD, AND THE BIRD #1 is available now at your FLCS or at darkhorse.com.